This Saint, from Melitene in Armenia, was the son of pious parents Paul and Dionysia. He was born about 377. Since his mother had been barren, he was named Euthymius-which means “good cheer” or “joy”-for this is what his parents experienced at his birth. He studied under Eutroius, the Bishop of Melitene, he was ordained and entrusted with the care of the monasteries of Melitene. After he had come to Palestine about the year 406, he became the leader of a multitude of monks. Through him, a great tribe of Arabs was turned to piety, when he healed the son of their leader Aspebetos. 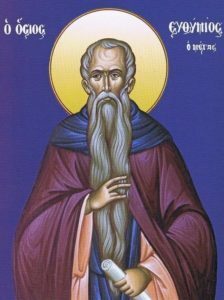 Aspebetos was baptized with all his people; he took the name of Peter, and was later consecrated Bishop for his tribe, being called “Bishop of the Tents.” St. Euthymius also fought against the Nestorians, Eutychians, and Manichaeans. When Eudocia, the widow of St. Theodosius the Younger, had made her dwelling in Palestine, and had fallen into the heresy of the Monophysites which was championed in Palestine by a certain Theodosius, she sent envoys to St. Symeon the Stylite in Syria, asking him his opinion of Eutyches and the Council of Chalcedon which had condemned him; St. Symeon, praising the holiness and Orthodoxy of St. Euthymius near whom she dwelt, sent her to him to be delivered from her error. He became the divine oracle of the Church, or rather, “the vessel of divine utterance,” as a certain historian writes. He was the instructor and elder of St. Sabbas the Sanctified. Having lived for 96 years, he reposed in 473, on January 20. Dr. Alexander Xenakis (19 years) husband of Kaliope and father of Demetrios. Peter Michel (8 years) brother of Kaliope Xenakis, father of Anthony Michel, grandfather of Alexander and Demetrios. Today’s Gospel provides for us an opportunity to see ungratefulness, “first hand”. This foreigner, a Samaritan, did not just assume it was his right to be healed. He was a foreigner. BUT he had faith that he could be healed if he asked. And God, in the person of Jesus Christ, healed him. “Your faith has made you whole”, said Jesus. And, out of ten lepers healed, only the ONE, the XENO, the foreigner, returned to give thanks to God for his healing. The one who returned did not assume it was his right to be healed, as the other 9 did, evidently. He was so thankful, so, “grateful”, that he returned to give thanks for his healing. To be faithful as the one leper who returned to give his thanks to Jesus, you must believe Jesus can save you. Trust and faith in Jesus Christ leads to our own healing from our sin, the distance we keep from Jesus, just as the lepers, because we are in a state of sinfulness. He knows our requests. He knows what we need. He wants us to seek from Him what we need, to be healed, to be saved. Like the leper in this story from this morning’s Gospel lesson, we must do what He instructs us. Our prayers ARE answered. However, God does not just perform some act of magic. We need to take an active role in fulfilling the requests we make of HIM. Glorify God in you new life (without as much sin), a life in imitation of Him. We must turn to HIM and give thanks, like the ONE leper who returned and gave thanks for being healed. We must offer up our thanks for God answering us in our need. Who will you be like? Who will we be like? Like the villagers who maybe believed but never acted? Like the nine lepers who accepted the healing as a right and never returned to give thanks to God? Or will we be like the one leper whose faith was complete, who not only took what God gave him, but returned to give thanks for the gift of healing? 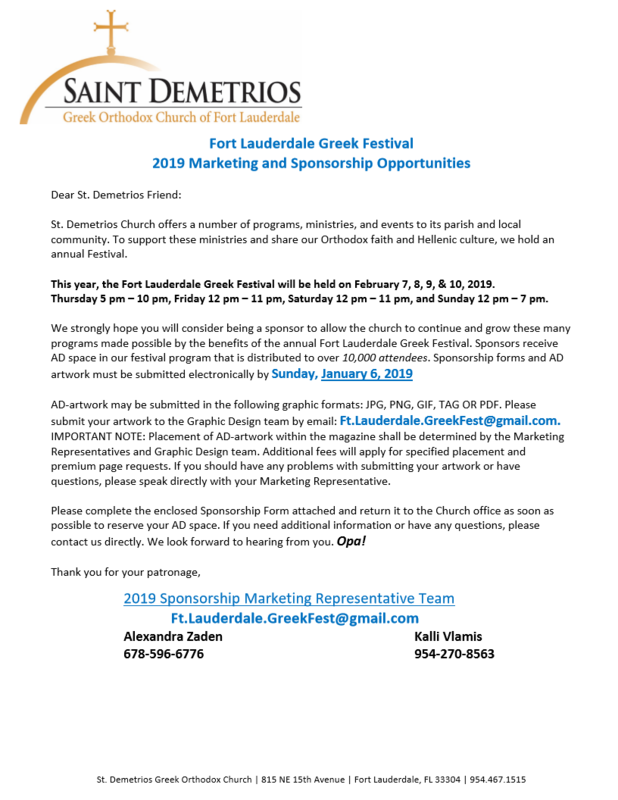 Dance Meeting A brief Annual Parent Festival meeting will be held on Sunday, January 27, in the hall, immediately following the Divine Liturgy. 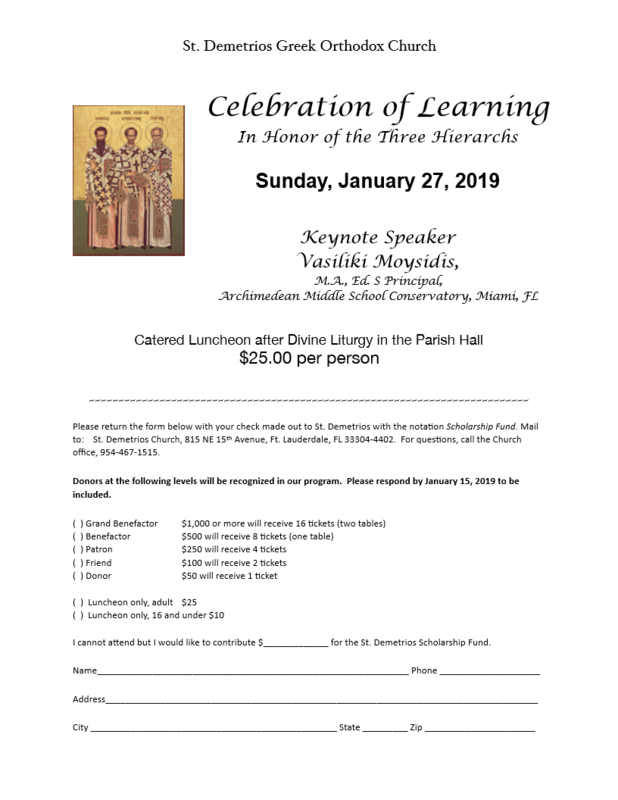 We hope you join us on January 27, 2019 for our 3rd “Celebration of Learning” event. 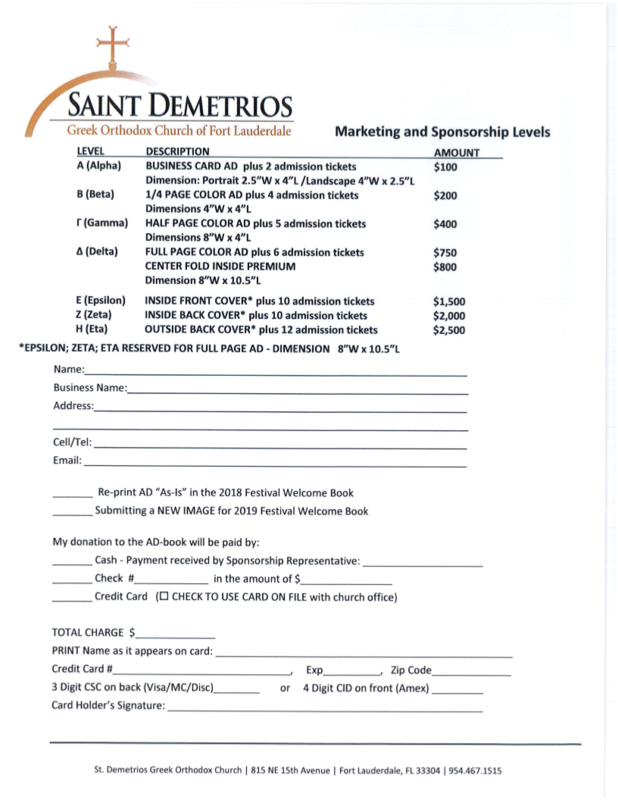 Look for flyers in the South Narthex and at the coffee hour for more information about the event. Your continued support and commitment allows us to maintain and grow scholarships for a variety of educational and spiritual programs. There will not be a Coffee Hour on Jan. 27 due to the luncheon.